Not so long ago, well the 80’s, very nearly every car on the road was dreary. Think Renault 12 with a beige interior, or a Vauxhaull Viva slowly disintegrating while you drove along trying not to look like the Flintstones. These were gray days indeed, but there was always light at the end of the tunnel. There were some great 80’s cars, the Delorean, the Fiat Spider even the Golf was great. The thing was, none of them worked for very long. Most cars in the 80’s were broken just after you signed on the dotted line for the 5 year payment plan, so you had to push your car home so the neighbours could come see your new lawn ornament. Fast forward into this decade and you’ll find things are a little different. You would be hard pressed to find a bad car now, anything from the last 10 or so years is probably still on the road and going strong. Can you imagine any of the 80’s cars still going after that long? Sure there are still problems with todays cars, look at Toyota owners driving around nervously waiting for their car to career into the nearest wall, they don’t even have mats in their cars anymore. 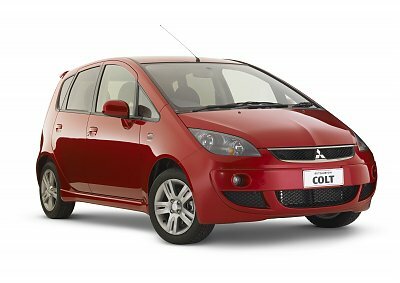 So what of the Mitsubishi Colt, where does this little car fit into the grand scheme of the 80’s reminisce? Well it reminded me that a car can be a bit basic and still do a job. Make no mistake this is a small car, it’s billed as a city car and the 1.1ltr three pot I drove was making a terrible noise at anything over 100kph. Now admittedly the car I drove was a 2009 model, there was lots of miles on the clock too. What really made me think of the 80’s when I drove the colt was the dash. It was just a swash of gray plastic, it would have been from a Renault if it was off- beige. But the dash aside, it was comfortable with nice (gray) seats and a good driving position, I also like the driving position in the Smart Four Four which which the Colt shares it’s underpinnings. The radio was useless unless you wanted to hear Gerry Ryan (RIP), there didn’t seem to be any other channels that would tune on it. The gear shift was sharp and direct, but you needed to push the engine to get anywhere. Around town it would be fine but at anything like motorway speeds there was a constant drone of the engine that seemed to get louder as I turned up the radio. Not a bad looking car, you’re not going to get anything other than a toddler in the back if you’re 6 foot or over, and forget getting that pram into the boot, nothing but a pushchair will fit. But there is one thing, you can completely remove the back seats making a very small van. All in all it was an OK package, nice for the first time driver. But if you’re looking for that car you can park in the city and drive in the country there’s far better out there, the Fiat 500 for one. A little lacklustre then just like the 80’s, the best driver out of the line is the 1.5 turbo, much more refined but you won’t get one in Ireland they didn’t sell much here.